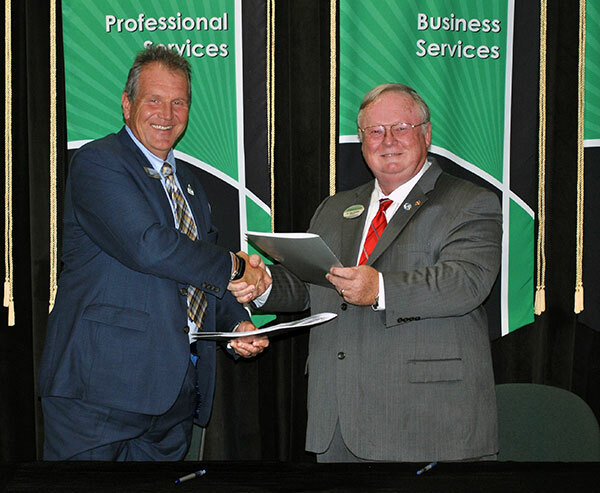 Dr. Christopher Blake, left, Middle Georgia State president, and Dr. Lloyd Horadan, Oconee Fall Line Tech president, signed the transfer agreement at a Tuesday, Sept. 19, ceremony held at OFTC's Dublin Campus. Thanks to a new formal agreement, students who complete specific academic programs at Oconee Fall Line Technical College can seamlessly transfer to Middle Georgia State University to complete degrees. Dr. Christopher Blake, Middle Georgia State president, and Dr. Lloyd Horadan, Oconee Fall Line Tech president, signed the agreement at a Tuesday, Sept. 19, ceremony held at OFTC's Dublin Campus. "In recent years there has been an unprecedented level of cooperation between University System of Georgia and Technical College System institutions," Blake said. "We are pleased to enter into a partnership with Oconee Fall Line Tech that will help more students in this region meet their academic and career goals." In addition to enabling Oconee Fall Line students to smoothly transfer into certain Middle Georgia State programs, the collaboration includes a unique feature: the Middle Georgia State Foundation will offer a $5,000 scholarship to OFTC's GOAL student each year. The state's technical colleges each choose one student per year to receive the Georgia Occupational Award of Leadership (GOAL) in recognition of their academic excellence and personal achievements. "This scholarship will help us attract the technical college's top graduates to Middle Georgia State," said Dr. Ken Fincher, vice president of Advancement and executive director of the Foundation. "We are privileged to offer GOAL recipients the opportunity to continue on to a University degree." The transfer agreement will allow Oconee Fall Line graduates to apply credits in criminal justice, IT, nursing, respiratory therapy, business technology and business management toward Middle Georgia State baccalaureate degrees. Oconee Fall Line Technical College graduates who want to take criminal justice courses can begin as early as October 9, when Middle Georgia State's second session classes for fall begin. The University's Dublin Campus plans to offer a second session criminal justice class that is mostly online but includes a few face-to-face class meetings. Several other second session criminal justice classes will be available fully online. Middle Georgia State University has campuses in Macon, Cochran, Dublin, Eastman, and Warner Robins, as well as many online programs and courses. The University offers bachelor's and master's degrees, along with a select number of career-oriented associate's degrees. Middle Georgia State is home to the state's only public School of Aviation. Oconee Fall Line Technical College offers a variety of programs of study that can lead to associate's degrees, diplomas or certificates. The College has campuses in Sandersville, Dublin, Louisville, Helena and Sparta, as well as online programs and courses. OFTC students who are interested in transferring to Middle Georgia State through the formal agreement can contact Laura Terrell at 478-471-2854 or laura.terrell@mga.edu.